Please refer to the “sales pitch” provided in the Tool Rack post spelling out all the advantages inherent in building one of these simple camp gadgets. 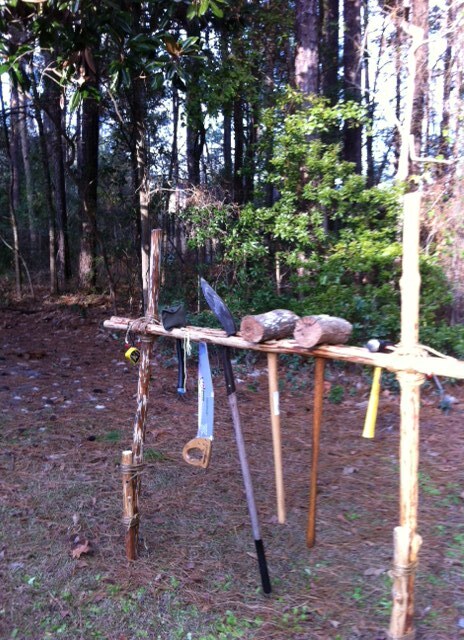 It is a good-looking campsite improvement project, but mainly, it’s got major functionality. The main difference between this version and the other is with the first tool rack, all the tools are hung, suspended by a cord from the upper cross piece and are supported by resting against the lower cross piece. In this tool rack, the tools’ handles are slipped in between two parallel cross pieces. This way, they’re held very nicely in place, and any shifting or wobbling around, often experienced in the first rack, is eliminated. The two racks are also constructed in like manner, again refer back to the Tool Rack post. No need repeating it here. However, in this version, the diameter of the two 6-foot uprights need to be a little larger than the diameter of the thickest handle of any tool you’ll be hanging. When you’re ready to lash on the cross pieces, lash on the first higher than the longest tool. It needs to be at a height easy enough to comfortably place the tools on and take the tools off the rack, without needing to reach up too high or bend over. Secure the first cross piece in front of the uprights with a couple of tight square lashings, and then secure the second cross piece to the uprights in exactly the same position, but on the other side of the uprights. You’ll be tying a tight square lashing here too, and there’s plenty of room to wrap and frap. That’s all there is to it. 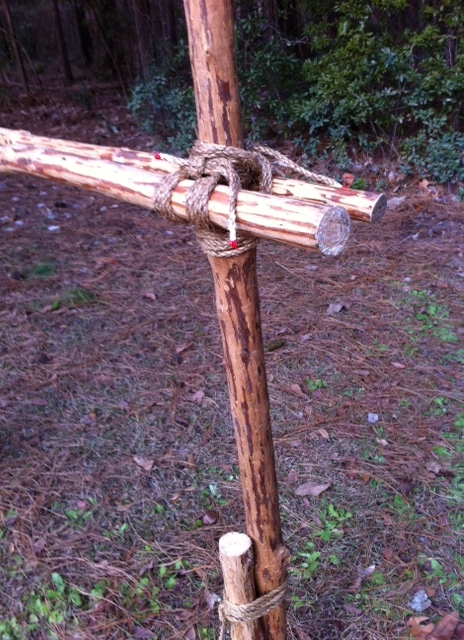 By the way, if you’d like to erect a cover over the tool rack, lash another cross piece to the very top, and rig up a tarp, using this third cross piece as a ridge pole. Protecting the tools from rain and providing a covered area for storage.